Now it hangs above our coats in our want-to-be mudroom/back entryway waiting to be used for keys, your cute Christmas card photos you sent us, inspirational words, who knows? Under $10 and under an hour? Most definitely. I LOVE it!! did you just staple the fabric to the cork? Love the green with the black!! Gosh, that is so cute! 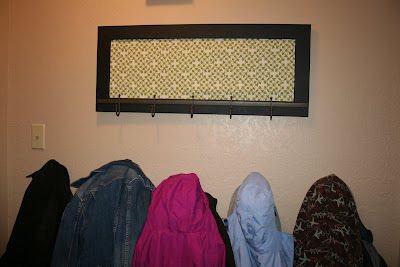 tidymom~yes, I just cut the cork board to size, used less than 1/2 yard of fabric and staple gunned it to the back. WOW! So cute. Love yard sales. ADORABLE! I am copying this idea, for sure! Thanks for your efforts in helping us keep it sassy! Cute! Cute! What a wonderful idea! Just wanted to say how much I enjoy stopping by and being inspired by your redos. I love your blog, each post is like fuel for my soul! I need to be inspired and you have inspired me many times over the last week! Thank you from the bottom of my heart!! this is GREAT! 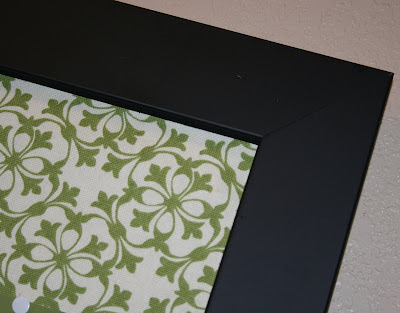 so you cut the cork board, staple fabric to it, then how do you attach the board to the frame? do you just make it snug enough to stay or do you use some kind of adhesive? i can't wait 'til garage sale season so i can get one of my very own!! Ugh. I want to BE you. Or just take all the stuff in your house. Kristal~yes, I just cut the cork so it made a pretty snug fit, and then there were some nails that held the mirror in that I pushed back, and then added a few more staples all around the edges for good measure. Good luck! I love the cheery green fabric too. Gosh, I have one of those mirrors at home just propped against the wall because I no longer like the hanging mirror of it all. You've got my wheels a turnin'....what a great job you did! Awesome makeover! And my favorite kind ...inexpensive, quick, easy and looks GREAT! Did you spray paint the frame or use some other type paint? I'm forever redo'ing items ...but me and paint are NOT 'friends'. Everyone else makes it look SOOOOOO easy! 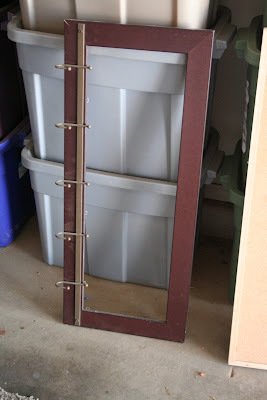 Fabulous makeover, I'm now on the lookout for a frame like that! I love it Melissa! The fabric is way cute with it. Sherri S~yes, it's just black spray paint. A girl's best friend! This is just beautiful! 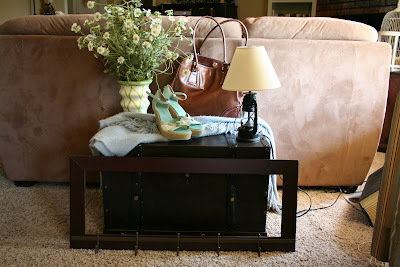 I have been looking for something for my laundry/mud room and this will be just perfect! Love the fabric you chose. Love the bulletin board! You have a good eye, girl! Love it! Where did you find that fabric?